D5181 with brake tender & mineral train in tow passes by Gateshead on May 27th 1966. In the memories of those of us that grew up in the diesel era Gateshead is probably best remembered for its allocation of Deltics, part of a fleet that brought a new sound and a new level of service to the long distance passenger workings over the ECML. Perhaps also fondly remembered were Gateshead's fleet of Class 47's, although in the shadow of the Deltics, they also accumulated many millions of miles alongside their more glamorous shed mates. Or perhaps it was the Class 46's in the twilight of their years that seemed to get just about everywhere, long after the Western Region had given up their allocation of Class 46's. Or maybe it was the large fleet of 'Flowerpots' that used to be a permanent fixture about Newcastle. This article however features a class of locomotive that were allocated to Gateshead from 1960 - 1974, the depot receiving twenty six new from the workshops, though their mundane secondary passenger and freight duties would have generally kept them out of the limelight. Many of the colour photographs on this page depict the 1980's period around Gateshead/Newcastle and come from the camera of Bill Richardson (BR). They feature more than just the Sulzer powered locomotives and I hope they add interest to this brief look at the diesel workings around Gateshead & Newcastle over three decades. The first mainline diesel locomotives allocated to Gateshead were English Electric Type 4's delivered from November for initial use on Newcastle - Edinburgh & Newcastle - Leeds/York services. It should be mentioned however that the Newcastle/Gateshead area had thirty years previously sampled the first Sulzer powered locomotives and railcars in the UK as they were delivered from Armstrong Whitworth's Scotswood plant and frequently tested locally. Photograph courtesy Bill Richardson In honour of the depot itself 08701 was named 'Gateshead TMD 1852 - 1991'. Darlington’s first main line diesel D5094 was ceremoniously driven out of the Works on January 12th. Trials, using empty coaching stock took place between Darlington & Newcastle, using both the main & coast line. Delivery to the Eastern Region was delayed until February 18th whilst minor adjustments were made. The largest allocation of the BR/Sulzer Type 2's to Gateshead totalled twenty two delivered between April 1960 and January 1961, arriving about two every month. The eighteen numbered D5096 - D5113 were in fact 'local' products from Darlington Works, part of the order of the first mainline diesel locomotives built there. The remaining four D5147 - D5150 were the last class 24's built, these coming from Derby Works. All were boiler equipped but the last four featured the modified cab design with roof mounted headcode panel. Although not allocated to Gateshead, Darlington's first Class 24, D5094 visited Newcastle in the middle of January whilst under test hauling empty coaching stock. Gateshead's first Class 24 D5096 was delivered in March, at the same time as the depot received EE Type 4 D270.For the Class 24's the early workings were out of South Gosforth, Heaton & Gateshead, including the 9.40 Newcastle - Newbiggin parcels and a parcels working to Carlisle. By summer the Type 2’s had returned to handling the Newcastle - York - Leeds services, D5097 on 7.30am Leeds - Newcastle and 11.05am return (July 9th) and D5099 on 11.40am Leeds - Newcastle and 5.33pm return (July 9th). At month end they were being used in pairs, so noted were D5100 & 5096 handling the 12.05 York - Glasgow relief. Summer found the Type 2's venturing to Leeds on passengers workings, previously a DMU working but now strengthened during the summer season, workings covered were the 7.30am & 11.40am Leeds - Newcastle and the 11.05am & 5.33pm return. 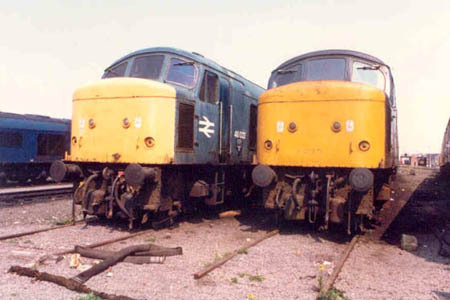 Noted on these working were D5097 (July 9th) & D5099 (July 9th). Further noted workings were D5100 & D5096 on July 30th's (SO) Scarborough - Newcastle via Gilling. For those Type 2's that made the journey to Carlisle on the 8.35pm parcels they were soon requisitioned to work back on the Stranraer - Newcastle boat train, D5103 so noted on August 10th 1960. During the last half of December Gateshead Type 2's replaced EE Type 4's on two trips north of Newcastle, the 6.55 am & 9.18am Newcastle - Edinburgh and the 1.30pm (Heart of Midlothian) & 2.25pm return. If this reporting is accurate then the 1.30pm working was one of the few named trains consistently (although only briefly) hauled by the Class 24's. An unidentified Class 24 heads north towards Heaton with empty coaching stock, date unknown. Photograph collection of webmaster. Whilst on loan to Neville Hill D14 was sent north on February 5th with a test train of fourteen bogies bound for Tyneside, possibly the first Peak to reach the Newcastle area. During March Gateshead received its first Deltic, D9002, delivered shortly after the arrival of Gateshead's last Class 24, D5150. With twenty two steam heat equipped Type 2's now at Gateshead their duties included many local freight workings including the Ponteland branch, taking over duties previously worked by J39's in many cases. Diagrammed passenger workings included the 5.33pm Newcastle - Leeds whilst on May 20th D5150 was noted at Leeds working a 3.30pm Manchester Victoria - Newcastle relief. D5150 briefly visited Darlington workshops during August, as did D5149, though the latter remained there until November for the repair of collision damage. The first Class 45's to be allocated to Gateshead were D14 & D18 during September and were principally used south of Newcastle. These two machines were quickly replaced by D22/24/30. The first Class 46's were all to be allocated to Derby (17A), but many were soon loaned to a variety of depots, it would be D146 that would become the first Class 46 allocated to Gateshead during November. In December D5112 & 5113 were exchanged with D5156 & D5157 from Thornaby (51L), the latter would remain at Gateshead until September 1964 when they returned to Thornaby. These two locomotives were from a batch of Class 25's that had no steam heating apparatus. By this time all the Haymarket based passenger steam turns to Newcastle had been dieselised. At the end of December Gateshead started to received its batch of eleven Class 37's, D6785 - D6795, the final members of this group were received at the same time as D5179 - D5182 (February/March 1963). If my notes are correct the 'police' Class 37 is 37093 (ex D6793), one of the original batch of eleven Class 37's received by Gateshead late in 1961. Who could have imagined that some twenty years later the drab olive green livery would receive this unmistakeable paint job for a short while! The locomotive stands in front of the main train shed at Gateshead on July 23rd 1985. Gateshead’s Type 2’s now held a virtual monopoly on the local trip freights, frequently assigned to the Berwick, Carlisle, Thornaby & York workings. The Carlisle trips included two parcels workings, one of which returned on the 2.50am Carlisle - Newcastle passenger. They also frequently enjoyed outings on the 9.18am Newcastle (6.55am ex York) - Edinburgh, returning with the 2.25pm ex Edinburgh. From April 16 - 19 this turn was powered by D5147, 5097, 5104 & 5148. Late September also saw Gateshead's V3 tanks re-assigned to the Durham banking duty following the unsuccessful use of Type 2's on this working. It had been planned for the V3's working at Heaton to be replaced by Type 2's during January, this did not take place, perhaps due to the harsh prolonged winter, June was now the scheduled date for this transition including the Tyne Commission Quay workings. The severe winter led to some unusual workings through Newcastle. On February 6th snow had closed the WCML lines north and south of Carlisle and the Waverly route. This led to the down 'Flying Scotsman' and up 'Royal Scot' occupying adjacent platforms at Newcastle. The delayed up 'Thames-Clyde' was noted behind D162, drifts on the ECML at Stannington were not helping matters. During February D5096 moved to York (50A), closely followed by D5099 & D5100 in March. Steam took another hit in the area when five English Electric Type 3's took over Blaydon's leading mineral duties from February 25th. A BR/Sulzer Type 4 was also successfully tested over linesin the Consett area. Four brand new Class 25's were received from Darlington during 1963, D5179 & 5180 in February and D5181 & 5182 in March. They would be joined by D5177 & 5178 during June, both transferred in from Leeds Holbeck (55A). During March Tyneside got a glimpse of of the newly delivered Brush Type 4's, with D1502/06/07/10 noted in the latter half of March on a variety of duties including crew training to Carlisle & Haymarket. As the diesel and DMU fleets grew so the impact on steam workings escalated. Typical was the closure of Scarborough shed on May 18, the two diagrammed steam freight workings turned over to D5096/8/9 & 5100/76 the following Monday, however it was Gateshead allocated D5178 that worked that first turn on May 20th. Station pilot duties were managed by two Class 03's. On May 28 the first turn, the 04.30am York - Scarborough led by D5100 had 77004 as pilot, destined for the Malton - Whitby freight. However cinders from the ashpan set alight to the diesel necessitating the service of the Malton Fire Brigade. The service resumed behind 77004, the diagram later being taken over by D5099 which later failed on the last leg of the run, at Rillington on the 07:49pm Scarborough - York mail. Rescue came in the form 43014. Tyne Yard opened on June 10th whilst Heaton Goods Yard closed and all its allocation were transferred to Gateshead on June 17th, although many A3 & V3's would continue to be outstabled at Heaton. 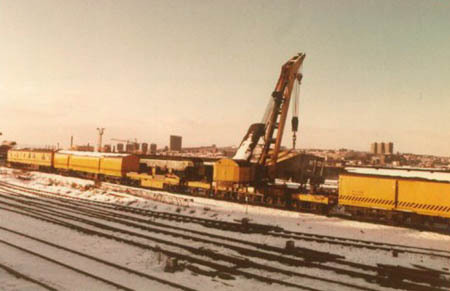 Many Type 2's were sent for use on the Tyne Yard duties, allowing the V3's to return to Newcastle's empty stock workings. However there was an acute shortage of diesels for the Tyne Yard area workings so V2's were borrowed from Doncaster & York. By July the passenger workings out of Newcastle were dominated by the Deltics & Brush Type 4's, even the EE Type 4's were downgraded to secondary passenger & freights. Early in September the Scottish Region released D8500 & 8536 to Tyne Dock (55H) for testing on the Tyne Dock - Consett iron ore workings and on coal trains in the Blythe & Tyne area. They returned to Scotland in October. On July 27th D172 on a Peterborough – Edinburgh passenger failed at Aycliffe, assistance arrived in the shape of D5103 & 5150, complete with brake tender! D264 was waiting at Newcastle to replace all three machines. From September 20th the J72's covering the Newcastle station pilot duties were replaced by the Class 03 diesel shunters. From March the Percy Main - Carlisle tank trains were taken over by Class 24's. From May - September Gateshead received a fleet of twelve new Claytons - D8592 - D8603. As an indication of the variety of motive power now to be found in the region Tyne Yard was host to D189/190, 284, 385, 2047, 3072 3316/17/21, 3943, 5101/112/149/180, 6785, 8593-97/99, 8601 on September 6th. The arrival of the Claytons were finally responsible for the storage of ten V3's at Gateshead & Heaton at the end of August, although continued non-availability of the diesels allowed some of the V3's to remain in service into October. Heaton would close to steam on August 29th, with most of its steam allocation stored, although it would remain a signing on point for diesels. Mineral traffic in the Blythe & Tyne area was forecast as continuing to require steam haulage at least until mid-1966. During the week before Easter, with its attendant holiday extras, March 26th’s 3.30pm Manchester – Newcastle ran behind D7578 hauling eight coaches. May 16th saw D5234 haul the 08.06 Newcastle - Birmingham, whilst the next day an unidentified BR Sulzer 2 worked a signal engineers special from Newcastle to Tweedmouth, across to St Boswells, Carlisle and back to Newcastle. By September Newcastle had only one regular steam passenger working, the 16.30 Newcastle - Berwick which ceased on September 5th. Gateshead A3 60092 hauled the last steam working on 4th, with the final run the next day being handled by D5178! In the winter timetable this became a DMU working. With the arrival of the winter timetable there were no diagrammed steam passenger or parcels workings in the Newcastle area, although steam substituitions would continue. Even the many Christmas season extras were nearly all in the hands of diesels. Elsewhere the South Pelaw - Consett banking duties were taken over by EE Type 4's, whilst paired Class 24's were now in charge of many of the iron ore workings. Gateshead from the early days would come to see alot of action involving the Class 45/46's, both on the NE/SW route and the London KX - Edinburgh route, the latter particularly with the Class 46's. But in this view the 'Peaks' days are nearly over, the 46's are long gone and afew 45's soldier on for a little while longer. Seen here is 97411 with a nice gash down the side. The dominance of the diesels continued, during January only three passenger trains from Newcastle were recorded as steam hauled, all in the York direction. Reductions to steam workings continued, Percy Main shed closed to steam at the end of February, its allocation of J27's sent to Tyne Dock for storage whilst its duties were taken over by J27's from South Blythe, as well as two more Tyne Yard duties being dieselised. Blaydon closed as a diesel stabling point in February, its diesels going to Gateshead & Tyne Yard. Perhaps the most significant event in the area was the closure of Gateshead to steam in the middle of March (sources quote either 13th or 20th). The depot had started to be cleared of steam on March 11th with six A1's sent to Tyne Dock for storage, whilst others went to York and ten V2's to store at Heaton. Possibly the last steam locomotive at Gateshead on March 13th was 60154 'Bon Accord' (55H), which was still there at month end. The repair shop however would remain open to steam for attention to the local Q6's & J27's. It was however the closure of the coaling plant that signified the end here, all incoming steam locomotives to Newcastle now had to return quickly either light engine or on another service, or risk having their fires dropped and await a tow home. Another significant sign of the times was the closure of over twenty freight depots during March & April in the Northumbria/Durham area - locations that would no longer provide traffic for the local freight/parcels workings. In the course of berthing its train off the Newcastle service on June 15th D5149 propelled the stock into a Scarborough - Leeds dmu in York station! Heavy maintenance on Gateshead's Type 2's had been dealt with mostly by Darlington Works, however the recent modernisation of St Rollox led to a greater influx of the BR Type 2's, not only the Inverness based ones, but also those from Gateshead and various LM depots, early June found D5012, 5107/5119 & 5129 under repair. During June departmental J72 #58 was transferred from North Blythe to Gateshead to provide steam for diesel bogie cleaning! D5177 & 5178 moved south to York (50A) during November. Possibly the final visit of an A3 to Newcastle was that of 60052 'Palatine' on November 23rd, arriving with a passenger from Birmingham & quickly returned to York. Such events would not be helped by the arrival at Gateshead between December 1965 and February 1966 of new Brush Type 4's D1977 - D1989. Looking forward the planners expected steam at Blythe to last until 1968, there were forty J27's allocated at the end of 1965. On December 31st an evening enthusiast special operating a round trip between York & Newcastle was billed as the last run of an A1 Pacific to Newcastle. The locomotive used was 60145 'St Mungo' which remained in service into 1966 as a standby for diesel failures. The closure of (52E) at the end of February led to the transfer of thirty four shunters to Gateshead. Steam still occasionally arrived from the north & west, St Margaret's V2's or Class 5's were occasional visitors to Tyne Yard on workings from Millerhill, whilst there was still one remaining steam diagram from Carlisle to Tyne Yard, covered by Kingmoor Class 5's. The news was little better down at Darlington, its shed closed to steam on March 26th whilst the Workshops closed a week later. New arrivals at Gateshead were Claytons D8588 - 8591 transfered in during June. Gateshead also exchanged most of its original batch of Class 37's with a like number from (50A). Further major transitions were taking place to help the Eastern Region retire its steam fleet. As part of a complicated set of moves Tinsley (41A) surrendered three Class 25's (D7647 - 7649) to the LMR whilst the WR sent three Class 37's (D6873/74/93) to Gateshead, coming from Scotland were ten Class 20's to Gateshead, whilst the ER shuffled its Class 31/37's to cover Tinsley's transferred Class 25's. The Newcastle - Stranraer summer weekend services regularly produced a steam/diesel combination, usually a Black 5 + a Type 2, typical of this was D7613 & 44995 on August 13th, though presumably this combination was on the service west of Carlisle. A tour of the north-east area sheds at year's end revealed just how far the diesels had taken up permanent residence, Darlington held eleven diesels, Thornaby three steam (s) and thirty three diesels (d), West Hartlepool 26(s) & 19(d), Sunderland 21(s) & 2(d), Tyne Dock 15(s) & 16(d), Gateshead 0(s) & 41(d), South Blythe 13(s) & 0(d), North Blythe 29(s) & 3(d), Heaton 8(s) & 5(d) and Tyne Yard 0(s) & 32(d). The Blythe area steam coal workings were frequently substituted by diesels on crew training trips, particularly when Gateshead had locomotives spare. The Gateshead breakdown crane raises its huge jib into the air on a sunny winter's day. The pattern of transfers instituted late in 1966 were repeated, eight WR Class 37's came to Gateshead - specifically for coal workings, eight Tinsley Class 25's moved to the LMR, ten Class 40's were moved to Gateshead, these transfers supported by new D83xx series Class 20's arriving at York & Thornaby & D95xx series shunters transferred to Hull from the WR. In January 5179 - 5181 moved to Leeds Holbeck (55A). The transition from green to blue paint on the locomotive fleet was starting to be noticed at Gateshead, the refurbished Class 46's coming out of Brush, Loughborough were in blue, local Class 40's in blue included D237 & 270, whilst the first Deltic in blue was D9002, followed in July by D9008 and Type 2's D5106/07. During June D5166 - D5169 were transferred from Thornaby to Gateshead, they returned south to Thornaby in November. More Scottish Type 1's arrived in June, Class 20's & Class 17's. D8028 was at South Gosforth for crew training in July. Double headed Gateshead Type 2's worked the Saturday's only Newcastle - Ayr - Stranraer passenger in both directions. So noted in June & July were D5097/5112 (24th), 5149/5112 (1st), 7601/5149 (8th), 7611/5051 (15th) & D5101/5112 (22nd), ScR examples filled in, especially on the eastbound runs after failures had occurred. Foundations were laid in June for a new diesel depot at Cambois, one mile north of the North Blythe steam shed, it was expected to be open in October. Full dieselisation of the Blythe & Tyne area had been expected in June, but in fact would not be accomplished as hoped for. Another loss to the area was the discontinuance of the North Tyneside electric service during June, the last services ran on June 17th, with much stock dumped at Heaton, which had ceased providing steam repairs as of June 3rd. By the middle of the year the ER steam fleet totalled 124, down from 340 at January 1st. Only thirty five were allocated to local sheds; West Hartlepool (51C) - eight, North Blythe (52F) - four, Sunderland (52G) - fifteen and Tyne Dock (52) - eight. The final summer working of the Saturday's only Stranraer - Newcastle passenger occurred on September 2nd with Gateshead's D5150 & 5147 in charge. Steam re-allocations at the end of September took away all remaining steam in the Tyneside area, either by transfer away or withdrawal. Four Class 20's from Immingham and three more Class 37's into Gateshead helped, the closure of eleven more freight depots was indicative of the decline in traffic. 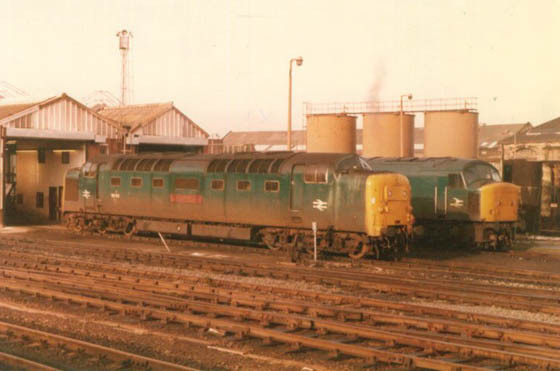 In September D5151 arrived from Thornaby, but did not remain long at Gateshead, in November it moved across the Pennines to Carlisle (12A) joining several other members of the Class 25/0's sent to assist in the eradication of steam from the North West. A daily trip from Carlisle occasionally brought steam back to Tyne Yard, usually a Class 5, 9F or Brittania. This working took on great interest for a short while after a landslip between Blaydon & Wylam caused the train to be routed through Newcastle Central and the High Level Bridge to reach Tyne Yard. After almost seven years at Gateshead D5147 moved south to Leeds Holbeck (55A) during November. With Cambois diesel depot now open North & South Blythe sheds lost their reason for being, the new depot being home to a fleet of shunters, Class 20 & 37's. A brief spell at Gateshead occurred for D5172, arriving from Leeds Holbeck in October and returning back there in December. The Easter holidays brought many extras, D5053 worked a round trip Manchester – Newcastle passenger on 11th, whilst D5061 + 5276 were noted later in the day on another Manchester – Newcastle express. Following in D5147's footsteps D5148 - D5150 moved to Leeds Holbeck (55A) during September, exchanged for boiler equipped 7586, 7593 & 7596. At years end Gateshead was home to 185 locomotives including 5102 - 5111 & 7586/93/96. December also saw the withdrawal of three Gateshead Claytons - 8591/95/96. Photograph courtesy Bill Richardson Boiler equipped 25236 passes through Newcastle station during August 1981 with a train of bulk powered stuff. This locomotive spent a number of years allocated to Gateshead, from September 1968 to October 1971 & January to February 1972. A treat for D5149 on September 19th was to take charge of a two coach special conveying ER Board members on an official visit to Lynemouth Colliery. The special ran from Newcastle and involved the use of NCB rails between Woodhorn & Lynemouth. Possibly the extreme winter weather took its toll on Gateshead's paired Class 03's used in the Sunderland area on the South Dock - Silksworth turns. The regular machines were all under repair necessitating the borrowing of a Tyne Dock Class 24. This was quickly missed by the Consett trains, Claytons then being utilized until at least one of the Class 03 pairs, 2071/74 returned from repair. Glamorous front line duty befell 7586 on March 12th following the failure of Deltic 9017 on the 16:00 Edinburgh - Kings Cross at Newcastle with boiler trouble. Gateshead had no other air-braked machine available so the Class 25 was given the run of the ECML as far as Doncaster, putting up a creditable performance. In the north east April saw a number of unusual workings. On April 1st the 10.50 Elswick (Newcastle) - Ellesmere Port special (7Z21) had 5195 & 5031 whilst at noon the next day 5112 was noted at Malton with DE900271, a maroon inspection saloon. Six days later 6782 hauling the 11.40 Lincoln - Newcastle failed at Darlington, 5158 came to the rescue taking the train on to Newcastle. The summer only passenger workings between Newcastle, Ayr & Stranraer continued to feature Sulzer 2's. The 23.45FO Newcastle - Stranraer and the 13.50SO return working brought the following machines in July: 5188/5190 (5th), 5147/5281 (12th), 7555/7564 (19th) and 5182/5196 (26th). This service had seen Class 40's in 1968, though these had not ventured beyond Ayr due to lack of driver knowledge over the Stranraer line. Loads varied between nine & twelve coaches. Other services over this route featured Class 27's in pairs west of Carlisle. September 20th found an enterprising use of the ‘Tees-Tyne’ stock to work an excursion from Darlington to Welshpool via Newcastle, Carlisle and Crewe. The motive power whilst not spectacular was certainly varied. Tinsley based 1510 made the short hop to Newcastle, 46 across the Pennines to Carlisle leaving 211 for the long leg to Crewe. Here 5056 & 5146 finished the trip to Welshpool, the return working had the same power as outward except for the last leg. Not a bad run for GBP3.00. At year's end Gateshead held 182 locomotives, the Class 24/25 allocation unchanged from 1968. A fine panoramic view of Gateshead depot, although on a gloomy damp day, looking to the west, for a larger view of this scene here. The lines on the extreme left lead to the coast route to Sunderland & Middlesborough. The tracks branching off to the right lead onto the High Level bridge. 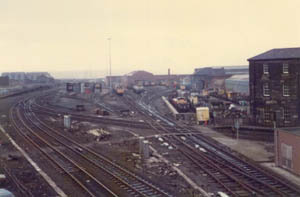 Center left is the 'daily shed' whilst the main shed and former loco works are to the right. One of the newly transferred ER 24’s, 5019 in multiple with 5173 found itself on front line passenger duty on January 23rd when the 12.10 Swansea - Newcastle arrived at York short of fuel. After a quick engine change the Type 2’s completed the journey to Newcastle, both returning south later that day on a parcels working. Another familiar landmark fell into disuse effective February 28th when Tyne Dock shed closed, with all crew and engines transferred to Tyne Yard or South Dock. 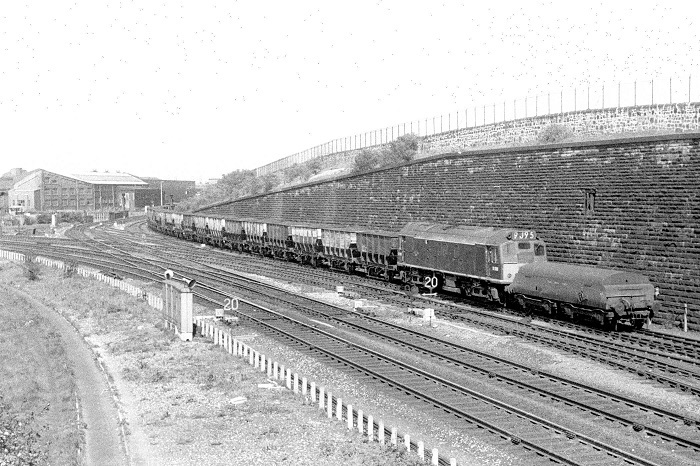 This included the Tyne Dock - Consett iron ore trains regularly powered by Gateshead's small fleet of Class 24's. On a related note trouble befell the 04.15 Tyne Dock - Consett working of April 7th led by 5102 & 5109, whilst standing at Tyne Yard it was run into by 6777. A quantity of iron ore spilled from the wagons, blocking the down slow line. 6777 received considerable nose end damage, necessitating major surgery at Doncaster Works. The 16.25 York - Newcastle parcels was noted with a variety of power through out the month, with 5229 (14th), 5211 (22nd) and 5154 (26th), all LM machines! The once busy and well patronised Newcastle - Ayr - Stranraer summer only services were heavily curtailed in comparison to prior years. The one remaining service, an out & back turn was dominated by ER Class 40’s. Also coming out of Newcastle on the 6M78 Tyne - Washwood Heath were pairs of Sulzer 2’s, 5073 & 5170 (June 12th) and 7518 &7651 (June 16th). The last summer season working of the 09.25 Scarborough - Manchester ran on September 5th behind 5182 whilst the 11.00 (SO) Filey - Huddersfield was noted behind 5147. November 21st saw the FA Cup first round matches begin, 5202 & 7650 worked a Wigan - Tyne Dock football special. The ecs ran onto South Shields allowing the locomotives to reverse and head off to Heaton Carriage sidings. The Tyneside area was currently in the grips of a local bus strike which required strengthening of many local dmu services. On November 23rd authorities did not have a dmu available for the 17.40 Newcastle - Carlisle (and 19.55 return), a scratch set of four coaches and no heat 5105 was used. The mild weather and pre-heated stock presumably kept the passengers reasonably comfortable. Loco haulage over this line was then currently limited to one train a day, the 23.15 SO Newcastle - Carlisle (and 02.50 SU return). 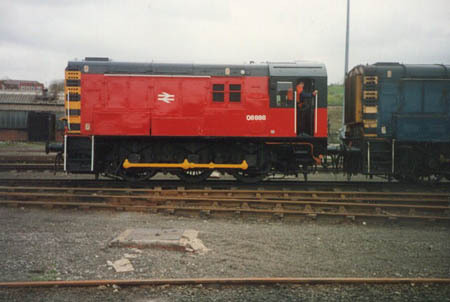 A boiler equipped Class 25 was regular power, 7586/93/96 being frequently used. More transfers from Leeds Holbeck to Gateshead included 5019,5090 & 5096 in May and 5168 & 5171 in October. Going the other way 7586, 7593 & 7596 returned to Leeds Holbeck after three years at Gateshead. Moving to Polmadie (66A) during October were 5019, 5090 & 5096 - see below. Whilst making its way to Glasgow Works 7593 powered June 4th’s 1S28 07.00 Newcastle - Edinburgh, but it returned south on the 1E83 14.15 Edinburgh - Newcastle, only to return north light engine that evening! The next day’s 1S28 had 5178 in charge having been taken off the early morning Edinburgh - Bradford parcels working. Later that night 5096 on the 2M72 23.18 SO Newcastle - Carlisle became a failure at How Mill, Kingmoor sending out 5191. This machine took the return working, the 02.50 ex Carlisle, and was promptly borrowed for Heaton’s ecs work until June 8th. It was the good samaritan again on 12th coming to assist the failed dmu on the 16.25 Newcastle - Carlisle, however this time the return working was cancelled. As well as continued use on the 14:15 Edinburgh - Newcastle Type 2’s also found use on the 1E29 18.35 Edinburgh - Newcastle, so noted was 7582 on August 10th. With the end of the summer timetable came one of the most radical changes ever witnessed to the diesel fleet. Withdrawals in October totalled over 120, coming from two distinct areas, the Western Region hydraulic fleet and the Scottish Region's NBL & Clayton fleets. These rationalizations saw the demise of the NBL built Warships, the Rolls Royce engined Claytons and the Beyer Peacock built Claytons. To cover the loss of this large number of machines an equally large number of transfers took place. The Eastern Region, that is Leeds & Gateshead lost most of their Class 24's to Polmadie (66A). 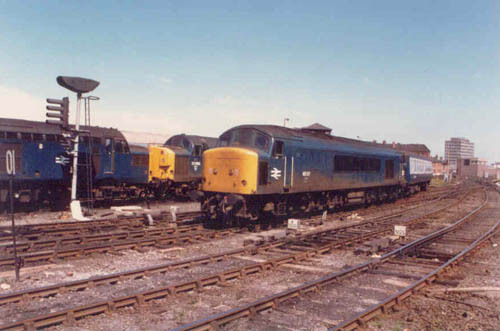 Gateshead sent its entire fleet of three Class 25's to Leeds, whilst the majority of Thornaby's Class 25/0's transferred to either Eastfield or Leeds. Joining the Types 2's at Eastfield were thirty Class 20's mostly from the ER, with these losses being covered by the reallocation of many Class 31 & 37's. Another eight London Midland Class 25's were transferred to Laira. Joining them at Laira were all of Landore's remaining Westerns, made possible by an influx of twenty Class 47's, these moves now left all the Westerns allocated to Laira, with the majority of the remaining Warships at Newton Abbott. The only Class 24's not allocated to the LM or ScR were 5102-11 still at Gateshead for the Consett - Tyne Dock service. A fine view of standard BR blue issue locomotives on the 'daily' shed at Gateshead. Both sport technologically challenged engines, 55011 with its twin Napier Deltic highspeed diesels and the Class 45/46 with its 12 cylinder twin-bank Sulzer, a concept not found to frequently in the annals of rail traction. Scottish Type 2’s were frequent visitors to Carlisle & Newcastle, though forays further south were unusual. 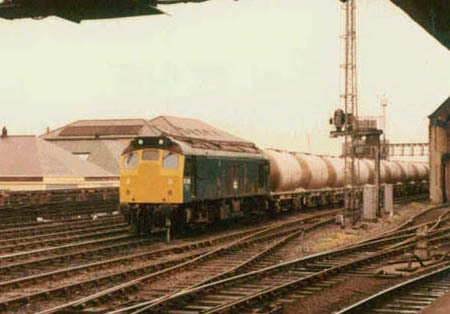 However on September 20th the 4E47 Aberdeen - Kings Cross fish train was noted at Doncaster behind Haymarket based 5066. Sister machine 5065 reached Bardon Mill colliery on September 7th on the regular turn from Carlisle. Front line duty came the way of 5013 on October 1st in rescuing the 1E91 07.45 Liverpool - Newcastle after the diagrammed locomotive failed. The WCML was blocked on October 6th after 1836 ran away with its train at Wamphray and collided with a preceding freight, the locomotive amongst other things was seriously damaged. Diversions saw the Carlisle - Millerhill freights run via Newcastle, amongst the local machines recorded were Inverness based ‘foreigners’ 5126 and 5119. Crewe based 5063 reached Tyne Yard with a freight from Scunthorpe on December 6th, returning southbound with a freight for Healey Mills. Unusual sightings on 7th included Toton based 5226 working a Skipton – Hartlepool freight, Holbeck’s 5162 hauled a Millerhill – Tyne freight and Gateshead’s 5110 was noted en route heading for Stratford, for maintenance? On 10th 7580 came to grief on the 1E83 Edinburgh – Newcastle, requiring assistance at Acklington from 6952. After a three month siesta at Leeds 7586, 7593 & 7596 returned to Gateshead in January. None of them remained here long 7586 returned to Leeds Holbeck in February whilst 7593 & 7596 moved to the Nottingham Division (D16) in April. More arrivals from Leeds Holbeck were 5169 & 5170 during April and 5172 - 5174 in August. These Class 25/0's did not stay long at Gateshead, 5168 returned south to Leeds Holbeck (55A) in April, whilst all the others went to Tinsley (41A): 5169 in July, 5171 & 5174 in August & 5170, 5172 & 5173 in October. These moves left no Class 25's allocated to Gateshead and there would be no further transfers to Gateshead for the Class 25's. However they would continue to be frequent visitors to the area, almost to the end of their existance in 1987 - and for the purpose of this article the more interesting sightings are recorded below. December 18th found front line duty for 5234 hauling the 1N31 Poole - Newcastle, noted 25 minutes late at Darlington. Five days later the 10.00 Liverpool - Newcastle failed outside Manchester behind 1576. Class 24 5024 brought the train into Victoria station, there replaced by 287, which itself was replaced at Leeds by 77, since the Class 40 could not heat the train. After eight years of the Class 24's working the Tyne Dock - Consett iron ore trains a dramatic change was effected with the iron ore now arriving by the trainload from Redcar hauled by Class 37's. For the Class 24's this meant a move to Scotland, for 24102 - 24111 this would be their first transfer. 24107/108/109/111 moved to Haymarket in March whilst the remainder moved in May, 24102/103/104 to Inverness, 24105/106 to Eastfield & 24110 to Haymarket. With these transfers Gateshead said farewell to its allocation of Class 24's, though visits for the class would still occur, particularly over the lines from Carlisle & Edinburgh. On October 20th 25241 powered the 11.34 Newcastle – Edinburgh. 24148 worked the local Hexham pick up goods on January 30th. Local press reports indicated growing traffic on the Carlisle – Newcastle line especially freight, with a number of ECML workings transferred to the WCML due to the shortage of paths on the former. The stock situation created comfort issues such as 46053 working the air conditioned 14.10 Newcastle – Kings Cross as far as York on April 4th and April 7th’s 10.10 Liverpool – Newcastle behind 45135 and steam heated stock, neither locomotive able to heat the stock provided. The infamous 1E83 17.10 Edinburgh – Newcastle continued to run behind a variety of motive power during September with 55004 (8th), 24110 (15th) & 24147 (19th). A Manchester – Edinburgh excursion arrived behind 25155 & 25139 on October 18th, a chilly trip if they worked throughout. A week earlier on 11th a Carlisle – Newcastle four car dmu was failed before departure, Kingmoor providing 25210 to haul the dmu and its passengers to Newcastle. Class 26's were occasional visitors to Newcastle, seen here stabled on the depot on July 28th 1987 is Railfreight liveried 26002. Probably the last operational Class 24's to visit the Newcastle area were Scottish examples on the 1E83 Edinburgh – Newcastle (?) which featured 24115 on September 15th & 24106 two days later. Looking east at Newcastle Central 25122 runs through with a train of coal on February 25th 1976. One of the resident '03's and match truck is overshadowed by the Keep directly behind it - although the only Scottish invaders this day might be the odd Scottish Class 40 or 47! Photograph courtesy Tony Sayer. March 30th found 25119 assisting the dmu working the 14.51 Carlisle - Newcastle. On July 25th the first of the ECML HST sets were undergoing commissioning trials between York & Darlington, two days later it was delivered to Heaton depot. Also in the vicinity was 25221 & 25222 on July 26th bringing the Royal Train ecs from Wolverton to Newcastle, via Carlisle. At Newcastle Princess Anne boarded for the journey to Dumfries. The weather again made the headlines commencing the second week of February. From 7th cold air invaded from the east, bringing with it much snow, six inches in Kent (9th), a foot at Newcastle (13th) and Edinburgh (12th) with temperatures dropping to minus 17F at the latter. The freezing conditions at Newcastle caused considerable dislocation of stock due to points failures and frozen up stock at Heaton. Icicles in Haltwhistle tunnel broke the cab windows of 37194 on February 19th whilst running light from Carlisle. March 11th saw four military specials run from Rosyth to Ludgershall. All changed locomotives at Newcastle, 1Z72 arrived behind 40030 and left with 25066 (HA) & 25232 (ED), this pair had brought in 1Z73 surrendering that to 47273. A strange maneuver assuming it is reported properly, which would suggest that the pair of 25’s were the only machines to make the whole trip, but having worked two separate trains! On May 6th 25247 was noted in charge of the 17.10 Edinburgh - Newcastle, a working which seemed capable of being hauled by anything Haymarket could turn out, including dmu’s. Two days later regular scheduled working commenced of the first of the new HST sets on the ECML. Initially six sets were in use, four sets on Kings Cross - Edinburgh workings, the other two on Kings Cross - Newcastle’s. Concurrently the Hull and Yorkshire Pullmans were discontinued, a number of the Pullman coaches were later noted in use on LM Motorail services. Its May 1982 and 45017 is in charge of a trans-Pennine express to Liverpool. By this time the days are numbered for the Peaks on this service, Class 47's are waiting in the wings. On July 22nd 25278 finally made its escape from Tyne Yard after having been laid up there since May 26th with a bad wheel set, the Gateshead crane was used to install a set during mid July. On a longer distance train 25272 & 25299 worked the 16.22 Newcastle - Cardiff on August 18th. Bad weather affected the ECML between Newcastle & Darlington, a heavy snowfall on March 17th delayed departure of the first southbound trains from Newcastle until 11am, whilst the local Berwick service was maintained despite closure of many roads in the area. The 18.00 ex Manchester arrived at Newcastle on April 1st with 25073. On June 25th 25271 was noted at Darlington hauling the 09.50 Bristol – Newcastle. On October 4th Cricklewood’s 25189 & 25236 worked the 1Z89 enthusiasts special from Watford to Newcastle via the ECML, handing over to 31156 & 31209 for the run to Carlisle. On July 21st 25157 & 25187 were in charge of the 07.20 Newcastle – Leeds parcels, whilst on August 25th the 07.30 Birmingham – Newcastle and 13.40 return to Swansea were in the hands of 25257 & 25301 - this was a working notorious for its variety of motive power if Saltley didn't have a Type 4 available. Passengers on November 19th’s 12.42 Carlisle – Newcastle dmu received a tow from 25272. On a chilly January 29th 1981 25194 runs past a well filled Gateshead. Photograph courtesy Tony Sayer. On the last day of July the Friday’s only Reading – York was extended to Newcastle and was worked north from Birmingham by 25268 & 25285, they returned the next day on a Newcastle – Poole relief. A late afternoon Manchester – Newcastle relief ran behind 25051 & 25152 on January 10th, one hopes the boiler in 25051 was operating. Perhaps because of the NUR action 25057 worked June 30th’s 21.05 Edinburgh – Kings Cross as far as Newcastle, returning north with a parcels working. On October 2nd boiler equipped 25086 was in charge of the 10.20 Manchester Victoria – Newcastle service. 25060 & 25120 spent some time in the North East in early November, 8th found them in charge of the Haverton Hill – Stevenston tanks whilst the next day they crossed the Pennines towards Carlisle with a Parkeston – Mossend working. On 13th 25042 arrived in Newcastle with the 19.35 postal from Bristol. 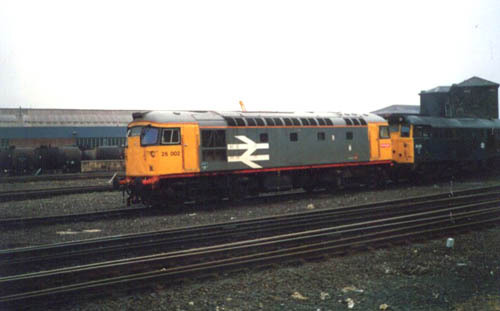 On March 9th 25206 & 25208 were in charge of an early morning Trafford Park – Newcastle Freightliner working. The new timetable found all but two trains on the Midland Mainline in the hands of HST’s, just a couple of overnight services remained with loco hauled Mk I stock. The released Class 45/1’s headed for the Newcastle – Liverpool – North Wales services. Other Class 25 haulage at the end of August featured 25323 on 22nd’s 15.38 Carlisle – Edinburgh, which started this day from Newcastle due to a derailment at Corbridge. October opened with 25051 & 25239 arriving at Newcastle with a Paisley – Sheffield special, going forward behind 31291 & 31327, the Class 25’s returning to Carlisle with an ecs working. January 23rd’s 10.15 Euston – Glasgow used 25185 & 25212 between Carlisle & Newcastle, but as nothing was available at Newcastle to replace the Type 2’s the train was terminated here, with the ecs returning to Carlisle. RDB97201 (24061) hauled a Derby – Carlisle (via York, Berwick & Edinburgh) test train on February 12/13th. On 24th 25032 managed a Tees Yard – Dringhouses Speedlink working, whilst 25266 having brought in a Garston – Newcastle freightliner returned quickly south with a Heaton – York ecs working. On the last day of February 25154 worked the afternoon Elswick – Ardrossan tanks returning the next day with the empties. Visitors to Newcastle from across the Pennines included 25181 & 25037 on March 8th’s evening Hardendale – Lackenby freight, returning later with the empties. The following week (15th) 25089 & 25209 handled these workings. 25181 paid another visit to the North East being noted at Thornaby depot on March 24th! A continued shortage of dmu’s in the Newcastle area created a number of locomotive hauled workings, 25078 being noted on a Carlisle – Newcastle service on April 6th. The ECML was no stranger to the Class 25’s though the use of 25278 on June 13th on a round-trip Newcastle - Durham evening commuter run was! The Class 25 had made a morning run from Carlisle to Newcastle covering a DMU turn, Newcastle sent the locomotive back, only to have Carlisle reuse it on a similar afternoon passenger turn, leaving Control at Newcastle no choice but to use it on the Durham service. 46022 and 45037 stand at Gateshead. The former is withdrawn and awaiting a tow to the scrapyard. On January 3rd 25259 hauled the afternoon Newcastle – Bristol postal working. The Newcastle region was still plagued with a dmu shortage, even those in service succumbed all to frequently, on January 14th 25044 assisted the 07.47am Newcastle – Carlisle dmu, continuing on with the return 10.38 service. On May 4th a diverted early morning Willesden – Coatbridge freightliner was noted through Newcastle behind 25249 & 25259. On June 27th 25072 was being used by Gateshead depot for the local Coxlodge working. Five days later when the 18.55 Carlisle – Newcastle dmu failed at Corby Gates 25231 was pressed into service to assist. September 23rd saw 25059 covering the 10.43 Carlisle – Newcastle passenger after the dmu failed. The next day 25244 was noted over the same route, eastbound in charge of a Stranraer – Scunthorpe freight, returning with a Tyne – Carlisle cement. Also in this area a regular evening Newcastle – Carlisle – Euston ecs working frequently used Class 25’s, 25200 so noted on 21st. The Research Centre’s Class 24 & 46 powered a short train to Kirkdale on September 23rd, returning to Derby on 25th. 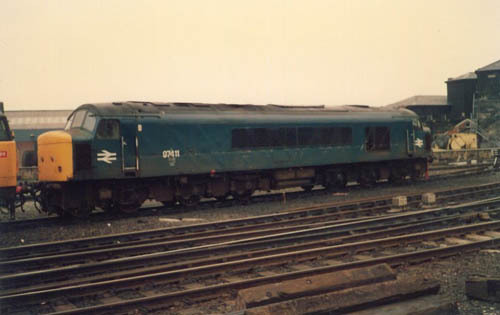 On September 28th 25285 was noted at Sheffield in charge of the 07.40 Leicester – Leeds service, later being noted at Newcastle arriving with a SAGA special from Eastbourne. Elsewhere 25323 returned to the north east on October 15th working a Stanlow – Jarrow oil train, whilst southbound on the ECML was a Tyne – York coal train behind 25288 & 56115! The next day 25286 arrived at Newcastle hauling a failed dmu on the 15.45 ex Carlisle service. Strong winds on May 27th brought the overhead wires down on the WCML, with a number of services being diverted. The 09.50 Paignton – Glasgow traveled via Newcastle with the leg to Carlisle covered by 25249. 25037 was called upon to assist the 18.52 Carlisle – Sunderland dmu on October 13th. The service was terminated at Newcastle, the dmu was taken to Heaton, the Class 25 returning light to Carlisle. Freshly repainted 08888 stands at Gateshead on April 19th 1991, normally in use as one of the station pilot's, it was soon to be named. 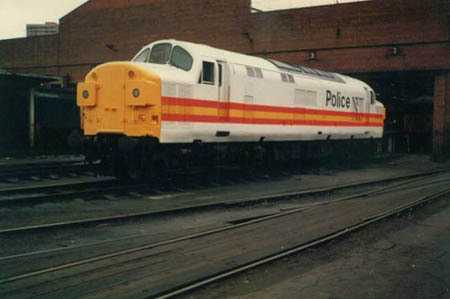 The first quarter of 1987 would see the end of the Class 25's in service. Although none had been allocated to Gateshead for fifteen years they would still make occasional visits to the Newcastle area. Generally they would be on turns from Carlisle. On January 27th 25058 was diagrammed to work the 21.55 Tyne Yard - Mossend 6S81. On March 3rd 25910 was in charge of the Tyne Yard - Mossend 6S81, this was probably therefore the last Class 25 to visit the Newcastle area in regular service. 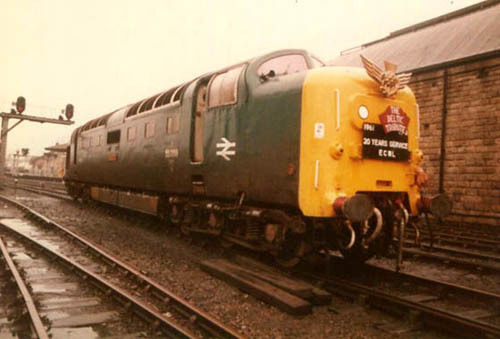 More photographs to be added as time permits and hopefully more updates, particularly workings involving the Peaks and the end of the Deltic era. Page updated February 16th 2004. Last updated September 17th 2014.